Nothing beats a glass of wine at the end of a long week. You’ve earned it, so don’t settle for anything other than the best. Red wine comes in many guises; from a full bodied Merlot to a lighter, fruitier Pinot Noir. But of course, when it comes to wine tasting, personal preference is a big factor, so while our research dictates that these red wines are, indeed, the best according to thousands of consumers out there, make sure you keep your own palate in mind. Fancy something a bit different? How about a G&T to tantalise those taste buds? Château Laroque Saint-Émilion Grand Cru Classé has earned a big thumbs up from us thanks to its full body and deep flavours loved by many. According to food match experts, it also pairs up magnificently well with a steak, and it doesn’t get much better than beautiful piece of beef and a glass of wonderful red on a Friday evening. If you prefer a lighter wine, you may want to scroll through to the medium bodied Yarra Valley Pinot Noir, a red wine with hints of raspberry that pairs it with flavoursome meats including lamb, duck and tuna. And best of all, with an RRP of under £10 a bottle, you can certainly justify a weekly indulgence. When it comes to medium bodied French wine, the blend of the Merlot, Cabernet Franc and Cabernet Sauvignon grape varieties certainly pull together nicely, with the showpiece being this Saint-Émilion all the way from the lovely Bordeaux region. Tasters call this an earthy wine, with a deep flavour mingled with mellow spice, thus making it the perfect accompaniment to a beautiful piece of beef. This Rustenberg blends full-bodied grape varieties to deliver a wine that on the palate, sings of plum, cassis, blackberry and black cherry. It’s earned itself heaps of 5 stars from tasters, with many of them commending its deep, refined flavours and versatility when it comes to accompanying food. Its finish is described as round and creamy, making it the perfect wine to drink solo, too. Revisiting the medium to full bodied wines, this Côtes du Rhône gives you the depth and boldness of a fuller body with a concentration on spice and dark fruits. Again, its flavours lend itself to rich, red meat such as beef or lamb, with tasters also commending its drinkability without an accompaniment. Lighter than the Rustenberg but still intense with flavour, this should be a fantastic choice to bring out on special occasions. If you’re looking for an accessible red wine, this Yarra Valley Pinot Noir will please the palate and the purse. Being a lighter red wine, its taste is slightly more acidic in nature to the full bodied wines, with the fruity elements being lighter, too. It’s medium body with raspberry undertones make it hugely versatile, with lamb, duck and tuna being the recommended food accompaniments. With similar characteristics to a classic Côtes du Rhône, this Crozes Hermitage blends dark fruits with savoury spices for a delightful palate pleaser. 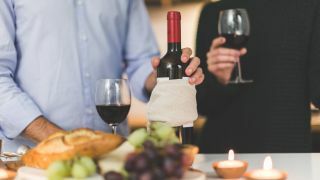 With a lighter alcohol percentage, it drinks like a medium bodied wine, which makes it a delight to drink on its own and with red meat and cheese. Tasters suggest that the 2014 vintage was a good year for the Syrah grape, so this wine should certainly deliver on all aspects. Red wines are renowned for their spicy, dark fruit flavours, which makes them a popular winter drink, but this Fleurie proves that red wines can be summery, too. Made from the Gamay grape, which is renowned for producing light wines, this Fleurie rewards the drinker with hints of strawberry and cherry and mild acidic flavour. With plenty of 5 star reviews this reasonably priced red is certainly worth stashing away for summer BBQs, with lighter meats such as gammon and turkey making it a good accompaniment. Indulgent in taste and in price, The Chocolate Block is an apparent ‘cult hit’ when it comes to wine tasting. And when you have had a hard week and your indecisiveness leads to you wanting both wine and a massive bar of chocolate, you can now indulge yourself with both. Tasters comment on its super-fine tannins and distinct chocolatey notes and with lots of 5 star reviews, we can only assume that this wine goes down extremely well indeed. Not everyone's partial to a glass of wine, so treat the spirit-lovers with one of the best whiskeys from our list.